Venture away from Dubai to Al Ain—known as “Garden City” due to its lush green spaces—an oasis in in the Rub al Khali desert. 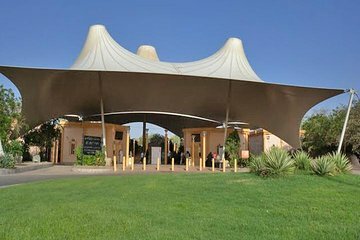 View an extensive archaeological collection at the Al Ain Museum, drive to Jebel Hafeet (UAE's highest peak), take a dip in the local hot springs, stop at a camel market, and visit Al Ain Conservation Zoo, where you can see rare white lions and tigers. A buffet lunch at the Ai Ain Hilton, national park fees, and a private guide just for your group is included.